The death was announced on Friday of the bookmaker Edward Flood. Commonly known by his nickname ‘Baldy’, Flood was a well-known figure within racing and regularly would appear in the betting ring, both at racecourses around the country and point-to-point fixtures, standing alongside son Justin at his Flood Bookmakers pitch. The 78-year-old, who was originally from Maynooth, lived in Sutton, Dublin and was one of the real characters associated with the betting ring over a number of decades. Last December, the pair were part of a novel moment, when Baldy and Justin stood the only pitch in the betting ring at Borris House for the point-to-point in December. Heavy snow on the morning of the fixture left treacherous driving conditions which prevented other bookmakers, amongst others, from making their way to the Carlow course. However the Flood’s were not put off by the conditions and ended-up having a monopoly on the ring with their one pitch. A number of other well-known figures from within the betting ring paid tribute to Flood on Friday evening. Belfast bookmaker Brian Graham added; “A great character and will be sadly missed in the betting ring. RIP Edward, condolences Justin and all the family. Flood will be reposing at Reilly’s Funeral home on Leinster Street in Maynooth between 4pm and 8pm on Sunday, with his funeral mass taking place on Monday in St. Mary’s Church, Maynooth at 12 noon. We extend our condolences to his wife Margaret, sons Justin, Richard and David, and his wider circle of family and friends. 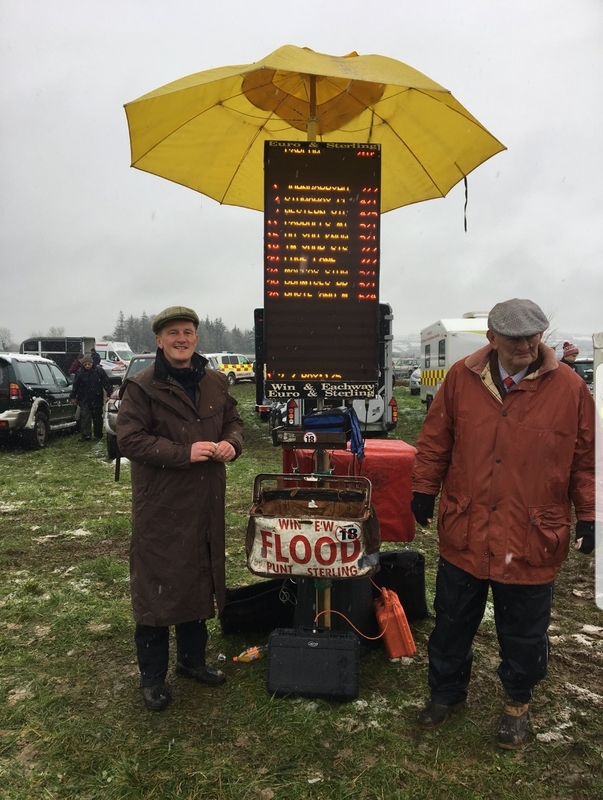 Edward Flood (right) stands alongside his son Justin at Borris House P2P in December, when the pair were the only bookmakers to make it through the snow to attend the fixture.